Deciding to hire an SEO is a big step that can potentially improve your website, but you can also risk damage to your website and reputation. Use our ratings and reviews solution risk free, we have proven record of results. Organic search results were invented to distinguish the real search results from the ads. Rich snippets enable sites to improve their search results with add-ons like ratings, reviews and photos, which draw the searcher’s eye as well as offering additional information. Rich snippets are an effective means of boosting your exposure in the organic search results. Google claims that their users click organic search results more often than ads. Using rich snippet helps Google to present users with the most useful and informative search results. The more information a search result snippet can provide, the easier it is for users to decide whether that page is relevant to their search, the easier it is for users to distinguish the real search results from the ads. With rich snippets your reviews represent a certain type of data: count of votes, star rating and etc. Search engines provide rich snippets not to play favorites with one page over another, but to enable searchers to make a more click decision. Providing this information doesn't affect the appearance of your content on your own pages, but it does help Google better understand, index and present information from your page. Check out an example of a Product Reviews rich snippet below. The Reviews markup type also includes the commonly seen Reviews Aggregate. Notice how the meta data features more intelligent, engaging content that provides better information about your product or service. We suggest taking a read of the Schema.org website for a more in–depth understanding of structured data mark–up. Today billions of users have access to the internet, each day they use search engines to find products and services. Search Engine Optimization(SEO) has become an important part of business growth and customer attraction. We provide SEO integration packages for our clients, and now they can generate them online, download and install. We are covering four major platforms: Java, PHP, .NET and Classic ASP. We provide it now for each widget/ratingbox, our clients can access that functionality on the Active Widgets page. This is a sample result SEO integration package provides here. Our SEO integration package provides Google, Yahoo, Bing and Yandex with much more granular information about products or service in a manner that is officially sanctioned by search engines. It means of providing very exact e-commerce information to the search engines in exactly the form they want it. It increases visibility and credibility in the SERPs when search engines generate rich snippets for a product in the search results. Here is a rich snippet in Google for a service on IntelliQuote, which uses schema.org Product and Review markup. Google is hungry for rich snippet markup. Rich Snippets Testing Tool allows you to make sure you have implemented Schema.org correctly. Our new ratings summary can be added to the top of the product reviews page. Customer can click the little icon to see a more detailed breakdown of the reviews. 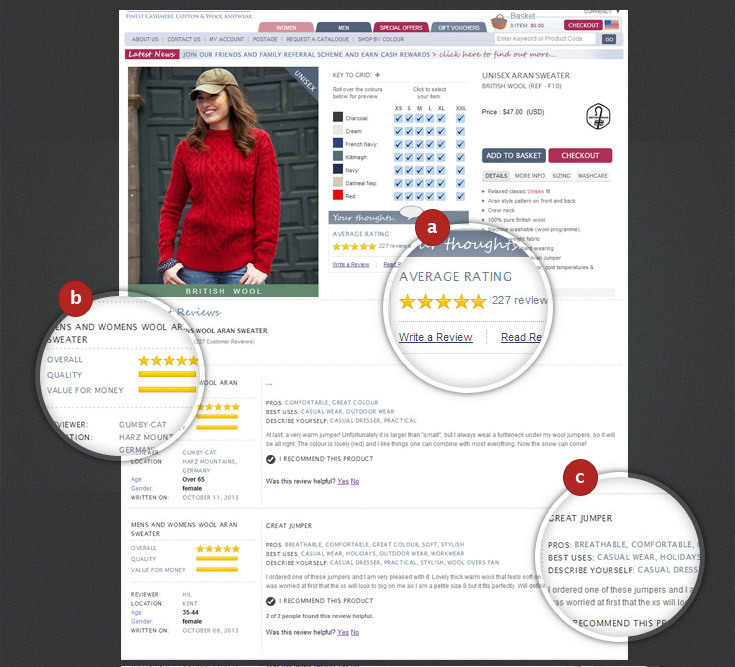 Customer can see the value and quality ratings and can filter out reviews by rating. Our online review system provides functionality to collect, distribute and aggregate feedback and comments about consumers’ past behavior. One of the major purposes of online reviews is to enhance consumers’ trust, which in turn reinforces their purchase decisions. The average rating based on multiple ratings or reviews. We format Ratings Summary using schema.org AggregateRating markup Google will discover it the next time it crawls your site and rich snippets will appear in search results.